Networking is definitely not a dirty word! It’s important, for sure. And we do it and need to do more of it. It’s all part of a balanced diet. Hard-core networking to us is the business equivalent of Kale. And I know… essentially what we’ve put together is a networking ‘wolf in sheep’s clothing’. But we don’t speak of it like that. It’s like fight club. If you label it as “networking” it ceases to be a thing and we start crying hysterically and turn into shivering amorphous blobs in the corner. So, please have mercy. Think of the children. 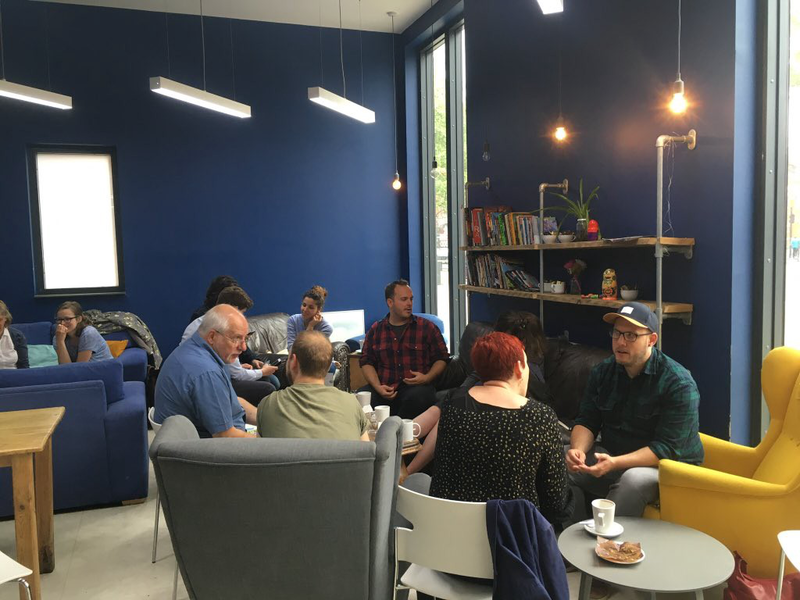 After a few hours of sitting, working our way through some studio ideas and a few croissants; chilled out and comfortable, we realised that we had met three new business owners and instigated exciting conversations, stacked with potential, with each.. And we barely noticed! Just chatting, casually, doing what we like to do, what humans should always do; being interested, asking questions, finding out more about the people that we’d come into contact with. Learning about their values, what makes them tick, whether they ‘pain au raisin’ or ‘au chocolat’. We realised that we had achieved more in that morning than we ever had done at a formal networking set-up. Now, Good Hope Café often plays host to business owners armed with laptops, doing what we were doing. It’s a wonderful thing. But we began to think about whether the casual nature of that morning could be formed into something slightly more concrete; structured and magnified a little. Across at the table a few metres away, we spied Bill Mizen (one of the brilliant brothers who created this network of cafes) and asked he’d be up for a quick chat. Sure, go nuts! Each to their own! If an exciting crowd turned up, chatted about anything and everything and left feeling connected, fulfilled and creatively stimulated; that would be a job well done. In the bag. Flapjack to celebrate, let’s get to work. So, we got to work. And we did it. Meeting one happened. And so started something new for us. Something exciting. A platform for us to meet new people. And celebrate local people and their many talents; and their passion and ideas.